The pituitary gland, also known as the hypophysis, is a small, pea-sized gland located at the base of our brains. It is commonly referred to as the “master gland” of the human body, as it releases a variety of hormones that circulate our system and aid in maintaining our internal homeostasis. Moreover, the pituitary gland is also the “master” or dominant gland controlling the activity of other glands. The pituitary gland is responsible for producing and storing an assortment of important hormones that we will discuss in more detail. The main function of the pituitary gland lies in its ability to make hormones that retain many of our bodily functions. The front (anterior) and back (posterior) lobes are the primary secretory glands. These glands are innervated by the nervous system. The pituitary gland also responds to signals within the extracellular fluid, such as the amount of dissolved solvent or other hormones. By responding to these signals and releasing the appropriate hormones, the pituitary gland plays a large role in coordinating many aspects of the body including metabolism, digestion, excretion, and many other factors. The pituitary gland releases at least 8 different hormones, which are responses to different stimulations of the gland. The pituitary gland is one of the most active glands within the endocrine system. The image below is an illustration of the pituitary gland as it is situated near the base of the human brain. The depiction shows its relative size. The pituitary gland lies roughly in the center of the human skull. It rests below the hypothalamus of the brain and behind the bridge of our noses. This location actually makes sense, in light of the hypothalamus’s role in fine-tuning the activity of the pituitary gland. This is made possible by the nerve fibers that span these two structures and allow for easy communication. 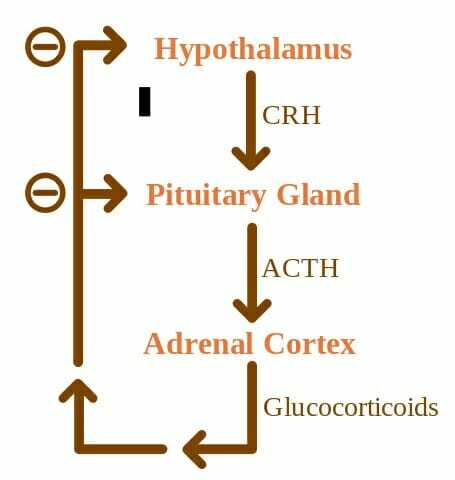 Likewise, a thin vascular connection that is forged within the pituitary stalk, or infundibulum, facilitates the hypothalamus’s control. 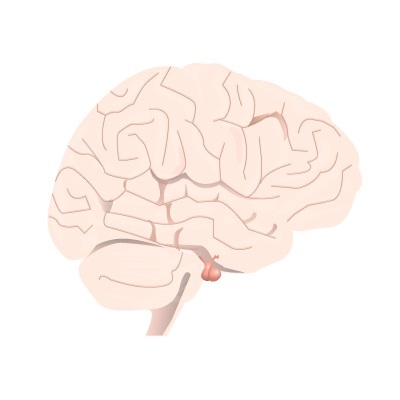 Further, the pituitary gland itself is supplied by branches off of the internal carotid artery. Its regulation is fine-tuned by a negative feedback relationship between the pituitary and hypothalamus. The concept map illustrates the complex regulatory relationship between the superseding hypothalamus and the pituitary gland. The relationship follows a negative feedback loop. As discussed before, the posterior lobe secretes oxytocin and ADH. Oxytocin not only stimulates uterine contractions to facilitate birth but also causes breast tissue to make milk, and is related to emotional processing within the brain that can stimulate the feeling of “love”. ADH, or antidiuretic hormone, is involved in the control of water retention within the kidneys. This hormone is released when the pituitary senses that the blood does not have enough water. In the kidneys, the hormone causes cellular changes which cause the tissues to retain as much water as possible. The anterior pituitary gland has a bigger roster of hormones. It produces prolactin, which like the posterior’s oxytocin will trigger milk production post-partum. Follicle-stimulating hormone (or FSH) is released to stimulate sperm production and egg maturation in women. Likewise, Luteinizing Hormone (LH) will stimulate testosterone release in men and egg release in ovulating women. One of the most important products of the anterior lobe is thyroid-stimulating hormone (TSH). The thyroid helps coordinate metabolic activity, and likewise, the TSH will stimulate thyroid activity. Therefore, TSH indirectly allows the thyroid to assume all of its roles. Adrenocorticotropic Hormone (ACTH) is released as well and will stimulate the creation of stress hormone, cortisol. Cortisol is essential to our survival and helps stimulate the stress response through its control over blood pressure and glucose levels in the blood. Lastly, the anterior pituitary lobe also releases growth hormone (GH), which is responsible for the muscle and bone mass growth that occurs during development. When growth is stunted, as it is with dysregulation of GH production, other complications can include serious illness or even cancer. Structurally speaking, the pituitary gland is notably parsed into three sections: the anterior (front), intermediate, and posterior (back) lobes. Each can be described according to their unique functions. The anterior lobe of the pituitary gland has primary roles in the development of the human body. This involves secreting hormones that orchestrate our reproduction and sexual maturation. These hormones will control growth as well as activate the adrenal and thyroid glands and sexual organs. The intermediate lobe will secrete hormones that stimulate the cells in our body that produce pigment, called melanocytes. These melanocytes are the reason there is such a variation in our skin color. Lastly, the posterior lobe makes ADH, which is the hormone that allows our kidneys to reabsorb water into the bloodstream to prevent dehydration. Oxytocin is also made in the posterior lobe and will induce contractions during childbirth. While these hormones are supremely important to our species’ survival, they represent only a small fraction of the hormones produced and released by the pituitary gland. Deficiencies of any of the hormones mentioned above can cause illnesses, which can vary in gravity. Starting with the posterior lobe, a deficiency of ADH will increase our thirst and urination. A lack of prolactin will quite predictably lead to an inability to lactate, which to this day cannot be treated. TSH deficiency has symptoms similar to those from a compromised thyroid gland, which includes fatigue, memory loss, and bodily weakness. A lack of LH or FSH will result in a decrease in libido, irregular menses, erectile dysfunction, and mood changes. ACTH deficiency will cause nausea, body aches, poor appetite, and even low blood sugar and pressure. Lastly, deficiency growth hormone will lower muscle mass and bone density, which has long term ramifications on the quality of our lives. An overproduction of hormones has its own consequences. Too much growth hormone can lead to gigantism and acromegaly, or too much growth of bones and soft tissues leading to heart issues and sleep apnea. Excess TSH will result in shakiness, irritability, and high blood pressure. Overproduction of prolactin will cause inappropriate expression of breast milk that can occur in women or men, and it can also cause a weakening of bones. Excess ACTH will cause weight gain among brittle bones and mood instability. Lastly, excess FSH and LH are linked to infertility and irregular menstruation. The most common type of pituitary gland disorder, however, are tumors. The grand majority of pituitary tumors are benign, or just a noncancerous swelling in the gland that may not cause any symptoms. Unlike many types of tumors, most people afflicted with pituitary tumors have no prior family history of issues with the pituitary gland and is not usually genetically inherited. One exception is multiple endocrine neoplasias (or MEN) which is a set of inherited disorders that lead the body’s endocrine glands, including the pituitary gland, to overexpress hormones. But pituitary tumors, specifically, still remain by and large benign. Various types of pituitary tumors exist. In general, people with a pituitary gland tumor will experience a series of telltale symptoms. Most will have vision problems, headaches, menstrual changes, infertility, mood changes, fatigue, and even Cushing’s syndrome. Cushing’s has its own set of symptoms including high blood pressure and weight gain, secondary to excessive ACTH release. The most common type of pituitary tumor is called a “non-functioning” tumor. The name derives from its inability to make hormones. These patients will have issues with their vision and headaches. Furthermore, pituitary tumors can be divided into three groups according to their problematic actions. Hypersecretion is the production of too much hormone. A pituitary tumor often leads to this condition when small. Hyposecretion, in contrast, is too little hormone production and is normally caused by a large pituitary tumor that will physically block the pituitary gland from making hormone. It can also result from surgical resection of a tumor. Lastly, tumor mass effects are the issues that arise from a growing pituitary tumor that is pressing against the pituitary gland and may result in compromised vision and headaches, as well. Other pituitary conditions worth noting include craniopharyngioma. This is a type of cyst or tumor that is congenital, meaning it is present at birth. It can swell and fill with fluid and may cause headaches and vision issues as well as sleep issues. ESS, or empty sella syndrome, is a disorder that arises from an affliction in the bony structure that encases the brain and surrounds the pituitary. A primary ESS will be a small defect that gives rise to high pressure in the bony base that causes the gland to flatten. On the other hand, secondary ESS will result from surgery or an injury that has caused the pituitary gland to regress. The symptoms will be related to pituitary function loss, such as infertility and fatigue. 1. Which of the following is released by the posterior pituitary? 5. Where is the pituitary gland located? A. At the base of the hypothalamus, near the bottom of the brain. B. Deep within the middle of the brain. C. Next to the spinal cord, in the middle of the back. D. The pituitary is found in none of these locations.